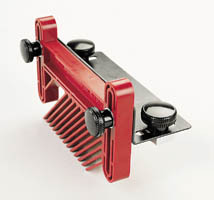 Special heavy gauge angle bracket attaches Feather Board to the T-Slot channel on the top surface of your (510 or 520) Rip Fence with two special, sliding T-Shaped nuts and knobs with threaded studs. 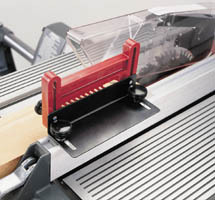 Provides added safety hold-down for workpieces as thick as your Rip Fence�s height. For use with Model 510 & 520 Rip Fences only. Includes: Bracket, Sliding T-Nuts, Featherboard & Knobs.